Nokia has announced the crazy looking new Nokia X5 smartphone to plug a (previously unseen) gap in its portfolio. Rather than the standard tablet candybar phones that are cloning one another in the market at the moment, Nokia's new X5 is a square design with a slide-out keyboard. The phone features dedicated media control keys, a 3.5mm headphone jack and a 5MP camera with LED flash, so it's not a terribly-specified device. It's also got a 2GB microSD card in the box to supplement the 200MB onboard memory, which can obviously be upgraded, especially if this does land in the UK as a Comes with Music device as well. You can also shake the phone to find out how many unread messages you have too – so if you're like us get ready to run and hear the word zero through your earphones over and over again. Nokia has given the X5 a release date of some point in Q3, with a pre-tax price of €165 (£135), although we're still yet to get firm information over a UK release date. 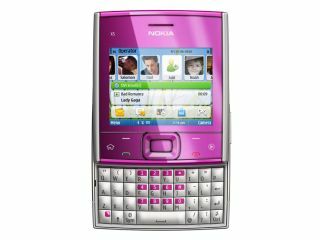 In related news, Nokia has also upgraded/downgraded the X6 – it now comes with 8GB of internal memory and should sell for around £190 when launched in Q3.